Defence Secretary Sir Michael Fallon today thanked the Armed Forces in Scotland for their bravery and hard work protecting the UK and projecting British influence around the world. 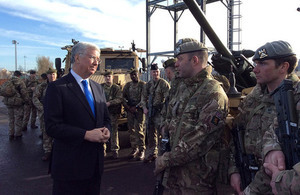 The Defence Secretary Sir Michael Fallon met soldiers from Scots-based Army units. During a visit to Edinburgh, Sir Michael met soldiers from Scots-based Army units. Many have either recently returned, or are about to deploy on missions with the UK’s allies overseas. Scotland is on the frontline defending the United Kingdom from growing threats at sea, in the air, and on land. Whether countering Daesh, improving security in Afghanistan, or playing a leading role in peace-keeping missions, Scottish troops deserve our gratitude for the incredible job they do. At any time, at least 20% of the troops from Army units in Scotland are actively involved in operational, defence engagement or training with other nations. Midlothian-based personnel of The Royal Highland Fusiliers, Second Battalion the Royal Regiment of Scotland (2 SCOTS) are part of the UN mission in South Sudan. They are also supporting NATO’s Very High Readiness Joint Task Force and is currently deployed to Kenya where it is leading battle group training for 950 personnel. Scotland’s 51 Brigade have taken part in exercises with the Emiratis, Kuwaitis and the Qatari Armed Forces. Scotland is also home to the UK’s nuclear deterrent submarines at Her Majesty’s Naval Base Clyde, and the Quick Response Aircraft at RAF Lossiemouth.